When I think of Newfound I think...Moose. So here's a Moose. I'd heard that all the moose traffic can make driving treacherous and was expecting to see a lot of them (and wanted too--from a safe distance). In the 2 weeks we were there... we saw 2! BIG boo. 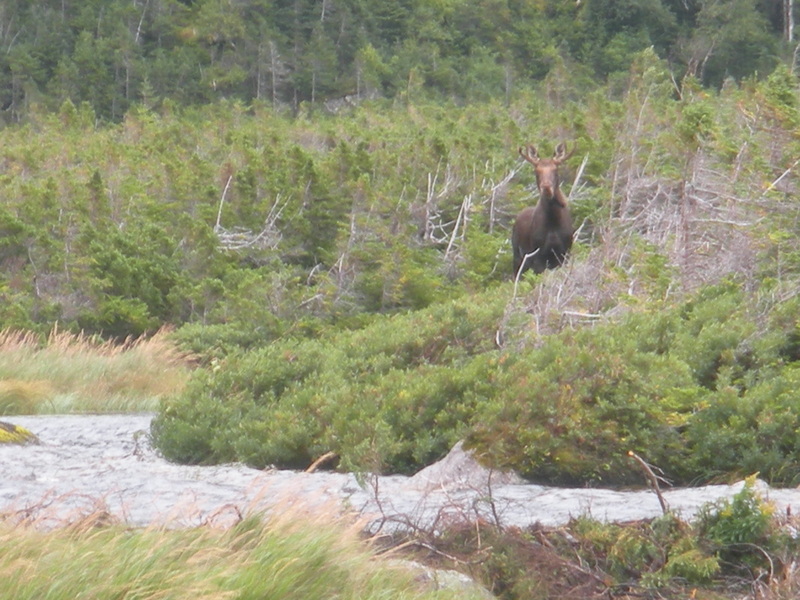 This guy was in Gros Morne National Park. I love museums and this picture was taken in The Rooms Provincial Museum. You can see windy Signal Hill off in the distance and all the colours of St. John's from the window. 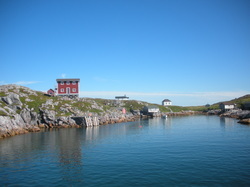 A sunny day on Little Fogo Is. A great day for a boat ride. Blue skies, calm water ='s no motion sickness for crystal. Look @ the size of those rocks! 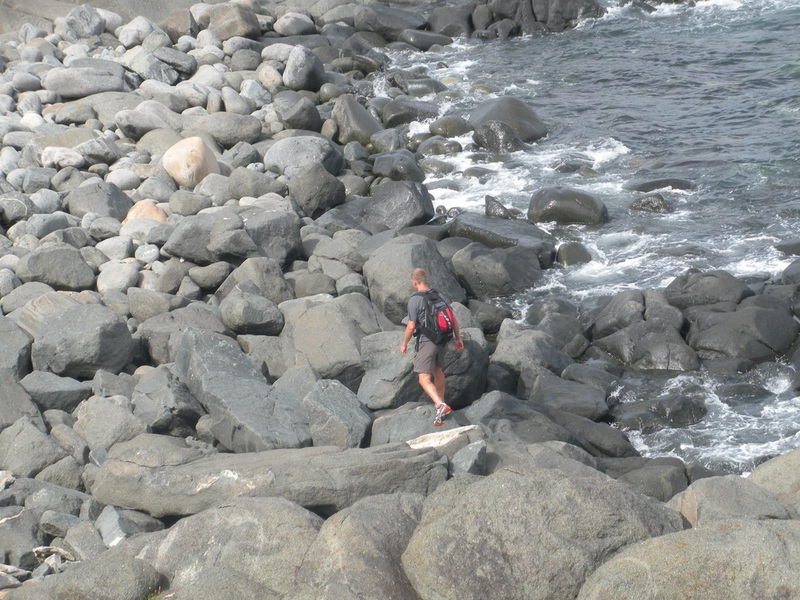 A walk on Fogo Is. (The big one). Hard to leave Fogo Is. when you have sunsets like this! Unbelievable! Unbelievable! I walked 10 km from Jīnshānlǐng to Sīmǎtái—the entire time thinking... 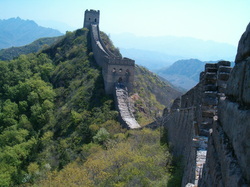 I can't believe I'm walking on the Great Wall. It was great. If all went well in the world of digital, the next pic would be of the Terracotta Warriors. Sadly, all did not go well. And, for the 2nd time... (Yes 2nd. 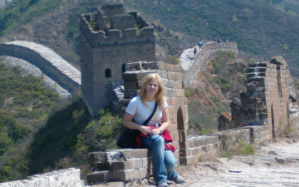 I actually went back to Xian on a mission to rephotograph the warriors) I have managed to return to Canada without a single picture of one of the most incredible sights I have ever been too. Hong Kong--such a great place, I could live here. 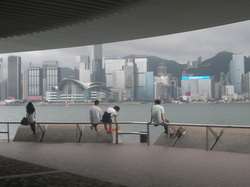 Only a 45 minute train ride from my home on the mainland, I spent many a weekend exploring the wonders of HK. 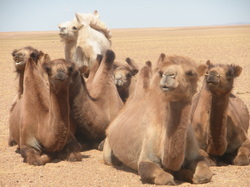 This would be where I learned that I quite like camels...although, not to ride. They are... as one may suspect...not comfortable—especially if they have a little trot going. 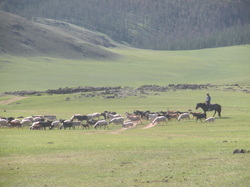 Mongolia captured my heart and to witness the Mongolians riding a horse is one of the most exhilaratingly beautiful things I have ever seen—horse and rider are an extension of each other; hair and mane flapping together in the breeze is the epitome of freedom. Not so much for me...after two days of 20 km rides, the lower half of my body demanded that I abandon my horse and walk a good chunk of the 3rd day! 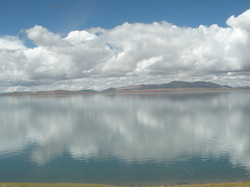 The raw beauty of Tibet is breath taking. 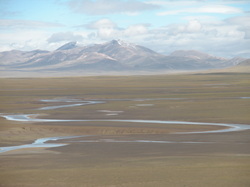 In my imagination I couldn't have constructed a more incredible place than Lhasa, Tibet. Daily many Tibetans engage in a kora (circuit) which can be likened to spiritual and physical exercise. 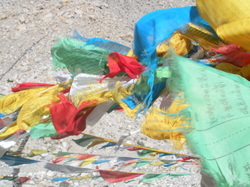 In Lhasa, the kora commences in Barkhor Square and pilgrims walk clockwise around the periphery of the Jokhang Temple. The people traffic can be quite heavy depending on the time of day. I loved walking in this collective energy of goodness; amongst Tibetans young and old spinning their prayer wheels; watching their fingers effortlessly travel over their 108 prayer beads as their lips expelled the sacred words of Buddha. 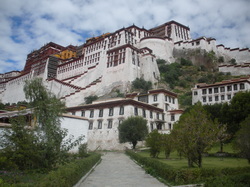 The Potala Palace stands on a hilltop overlooking the inhabitants of Lhasa. I saw the Potala many times during my 5 day stay, and it never lessened in grandeur. When leaving I felt a sense of loss that I wouldn't be able to see it again. From this vantage I felt that I looked up into the face of history and could see the His Holiness the Dalai Lama as a small boy gazing out the window. 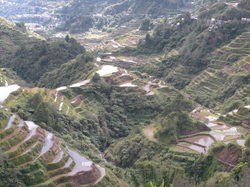 I've seen a lot of rice terraces and I would have to say some of the most impressive are found in Banaue, Philippines. The Ifugao rice terraces were carved out of the hillsides over 2000 years ago with primitive tools and have a sophisticated irrigation system. 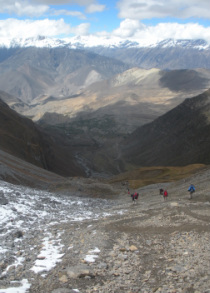 I was feeling rather ill prepared as we set off to trek the circuit—did I pack appropriately? Will I be able to carry my pack? Is this going to be hard? No. Yes. Yes. Fortunately, what I didn't pack I could purchase along the way and new friends and guides offered advice and shared expertise so we made it! This unseasonal dumping of snow proved to be a bit of a surprise...a tad slippery (I stopped counting the number of times I went down) and a nice colour contrast for pics. The circuit was a perfect combination of athleticism, (one day in particular comes to mind and I must confess...I wanted to cry. Had I been alone there would have been tears. ), culture and social—met so many incredible people from all over the world. My motorcycle driver dropped me off in the parking lot and pointed to the forest...off I went; all the while thinking where am I going?...When in doubt follow others. I did, and they led me to a clearing where a 7th century statue had me halt mid-stride. I stood. I stared. 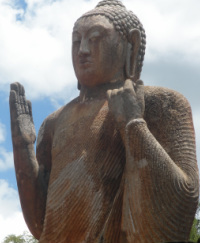 Over 14 metres tall and considered to be the largest free-standing Buddha in Sri Lanka. Also worthy of mention is that he was carved from a single limestone rock. 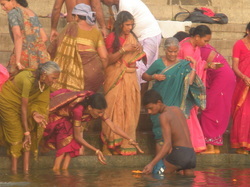 Pilgrims left lush lotus flowers; much like the ones pictured below at his feet. There were a couple of families leaving offerings and glancing over at the lone foreigner but once they had gone I was alone in the clearing with Buddha. 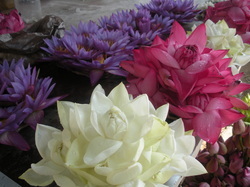 Lotus flowers. Food for the eyes. One of the most vibrant countries I have ever set foot in. Families bathing in the Ganges in the early a.m.
A short boat ride across the Mekong River to a cave but not just any cave...a 100m-deep cave filled with Buddhas—hundreds of small Buddhas on shelves: gold coloured Buddhas, wooden Buddhas, all in different postures: medititating, reclining, teaching, walking ...I thought it was fantastic. I loved it! 'The Buddhist Monastery on the Hill' was believed to be built sometime between 750-850 AD. I love Indonesia. 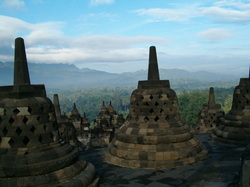 From from exotic islands, tropical breezes to mosques, Hindu and Buddhist temples; it's an incredible cultural collage. Sunrise @ Angkor Wat, Cambodia. Magic. I love the all fresh fruit. 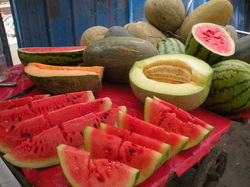 Especially yellow watermelon...who knew there was such a thing?! 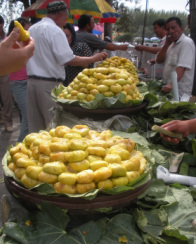 Figs in the market. Great presentation. 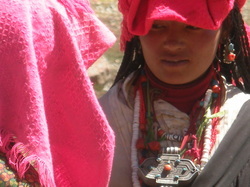 When travelling it's the encounters with the locals that makes the experience extraordinary. 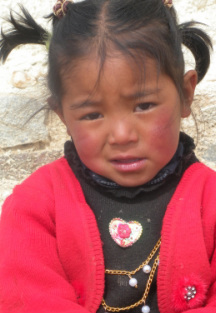 Young Tibetan. Isn't she just gorgeous. 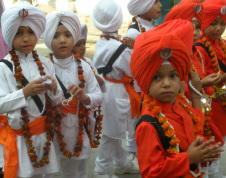 Sikh children outside of the Golden Temple in Armitsar, India. The temple is said to be guilded with 750 kg of gold. Some believe the Golden Temple rivals the beauty of the Taj Mahal. I couldn't pick one over the other; they're both extraordinary. I'd love to include a picture of the Taj. 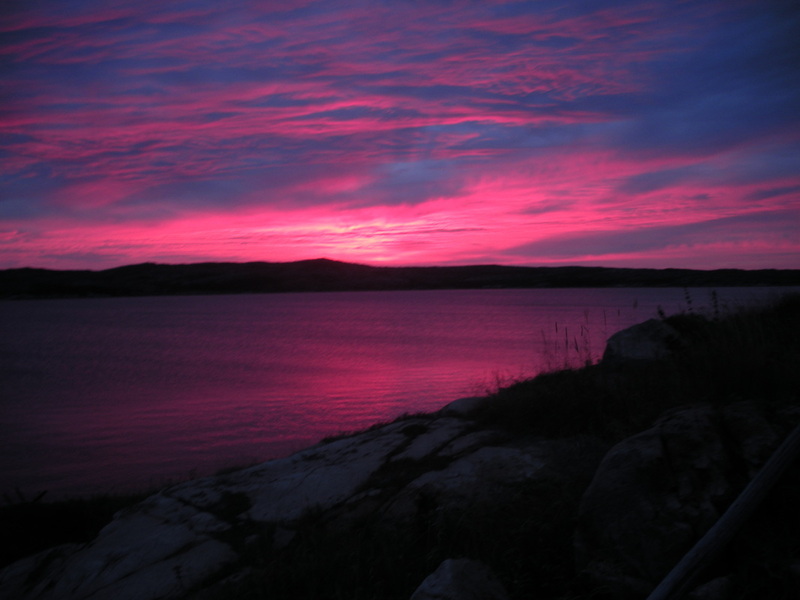 I was so excited to see it; I hauled myself out of bed @ 4:00 a.m. for a sunrise viewing and paid extra for a 'guided' tour. Although I question my guides authenticity, he did direct me to various locations around the complex that showcased the Taj from optimal angles—producing some of the most stunning photographs I've ever taken—of which, I have none in my possession. Yet, another bad digital experience. Now I'll have to go back to India. 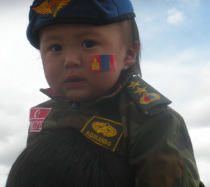 Mongolian child sitting on his father's shoulders. Whether it be Myanmar, Cambodia, Laos, China, India, Thailand, Tibet, Nepal...I am fascinated by monks. 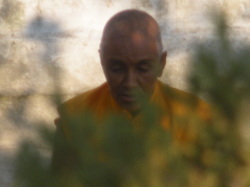 This meditating monk has made the pilgrimage to Bihar, India, where Buddha attained Enlightenment. 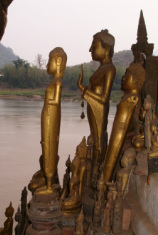 Considered to be a sacred place in four religions: Bon, Buddhism, Hinduism and Jainism. It is said that the holy ritual of circumambulating the 52 km on foot will erase a lifetime of sins...I was very interested in this. 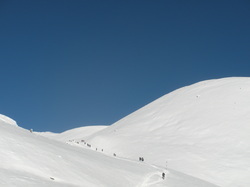 The kora begins at 4600m and at its peak reaches an elevation of 5500m. Some of the pilgrims walk Kailesh in a day...It took us a little longer. 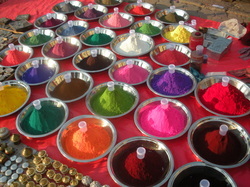 Seen strung all over the Himalayas. The winds blow compassion and good will to all.